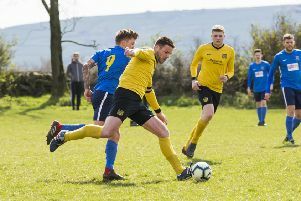 Shelf FC could be only three days away from a first Haslem-Sheppard Halifax AFL Premier Division title after an 8-0 home win over Sowerby Bridge yesterday. They need four points from their final two games at Westwood Park, against Greetland tomorrow and Shelf United on Friday, to deny Ryburn United the silverware. Shelf FC were completing a three-day double over a Bridge side who have finished third and were still clearly basking in the glory of last Thursday’s West Riding Trophy final success over Ovenden West Riding in Leeds. They won the first meeting with Bridge by 5-0 at Savile Park on Saturday and Callum Lewis (3), Matthew Hartley (2), Sam Henderson, Ewan Gardiner and Will Parkin got their goals in the return fixture.